The bitterness of Seville oranges isn't just great for marmalades; their tartness can also be put to use in this sharp marinade and dressing that contrasts with the sweetness of the duck. Put the duck breasts in a shallow dish with the honey and half the Seville orange zest and juice. Cover and marinate for at least 1 hour, or leave overnight in the fridge. Cut the pomegranate in half. Squeeze one half into a jug to collect the juice, then bash out the seeds from the other half and set aside. Peel the sweet oranges and slice the flesh into rounds. Bring the water in your steamer to the boil. Remove the duck breasts from the marinade and season. Steam, covered, over a medium heat for 10 minutes. Meanwhile, for the dressing, whisk the remaining Seville orange zest and juice, the walnut oil and olive oil into the pomegranate juice. Season the dressing and toss with the chicory leaves in a bowl. To serve, divide the dressed chicory between 4 plates and slice the duck. 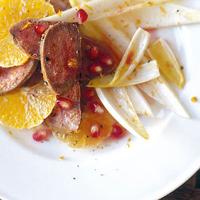 Arrange the duck on the chicory with the orange slices and pomegranate seeds. Classic duck partners such as beaujolais or burgundy would struggle with the intensity of orange and pomegranate, so try fruit-laden Chilean rosé instead.